Sri Guru Tegh Bahadur Sahib, the ninth prophet-teacher of the Sikhs was cruelly martyred by beheading him on November 11, 1675 in Chandni Chowk, Delhi under the orders of Emperor Aurangzeb. 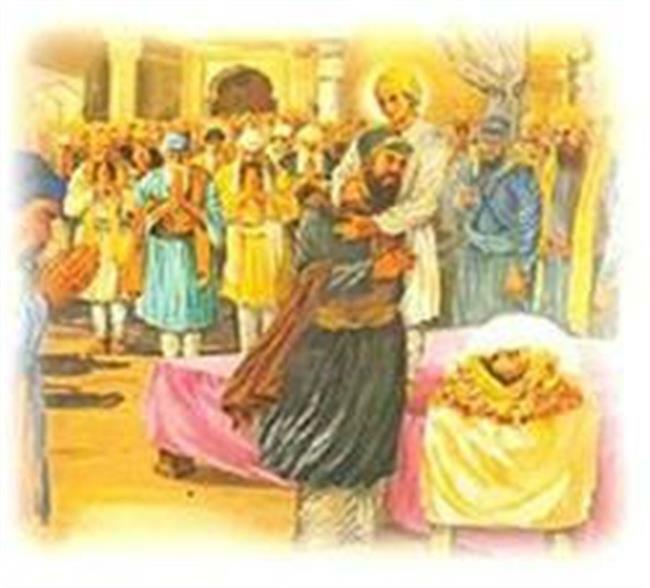 Besides martyring Sri Guru Tegh Bahadur Sahib, Aurangzeb also passed orders that the whole family of the person who goes near the deceased's body will be annihilated. The martyardom of Sri Guru Tegh Bahadur Sahib sent a wave of shock and mental torture among the Sikh community. The mental torture caused by the martyrdom was further enhanced by the royal orders that the whole family of the person who touches the deceased Guru Sahib's body will be annihilated. The Sikhs who had witnessed this distressful martyrdom included Bhai Uda Ji. After undergoing the unbearable mental torture of witnessing this gruesome incident Bhai Uda Ji with a heavy heart went to the house of Bhai Nanu Ji in Dilvali mohalla. This mohalla which is sometimes referred to as 'Dilvali Singh' and 'Dilvali Sikhan' is inside Ajmeri Gate near Hauzkazi at a distance of about half a mile from the place of execution in Chandni Chowk. The Sikhs who had witnessed this distressful martyrdom included Bhai Uda Ji. After undergoing the unbearable mental torture of witnessing this gruesome incident Bhai Uda Ji with a heavy heart went to the house of Bhai Nanu Ji in Dilvali mohalla. This mohalla which is sometimes referred to as 'Dilvali Singh' and 'Dilvali Sikhan' is inside Ajmeri Gate near Hauzkazi at a distance of about half a mile from the place of execution in Chandni Chowk. Writhing under the pain caused by the execution of their revered Guru Sahib, the Sikhs gathered in the house of Bhai Nanu Ji to share their sorrow and to plan ways and means to cremate the mutilated sacred body of Guru Sahib. In this gathering, in addition to Bhai Nanu Ji and Bhai Uda Ji, others who were present included Bhai Jaita Ji, Bhai Tulsi Ji, Bhai Agya Ji and Bhai Gurbaksh Ji. In this meeting Bhai Nanu Ji suggested that a devout Sikh of Raisina village Lakkhi Shah Lubana Ji who is a trader is returning from Narnaul (now in Haryana) with his caravan of carts loaded with cotton and is camping on the other side Yamuna river, should be consulted. Thus some of the Sikhs went to Lakkhi Shah Ji and informed him about the sorrowful incident. Lakkhi Shah Ji was instantly over powered by gloom and decided to take the responsibility of cremation of Guru Sahib's body. By that time night had befallen and a severe storm was blowing. Not caring for the reprisal of the Mughal rulers Lakkhi Shah Ji along with three out of his eight sons - Nagahia, Hema and Harhi and Bhai Kanha Ji's son Bhai Dhooma Ji marched towards the place of execution in Chandni Chowk. By this time, Bhai Jaita Ji and Bhai Nanu Ji had already carried off the severed sacred head of their worthy Guru. Thus Lakkhi Shah Ji put the sacred headless trunk in a cart and carried it off to his home in Raisina village. The guards on duty in Chandni Chowk could not imagine the purose of the caravan of carts passing through that place. In the early hours of November 12, Bhai Lakkhi Shah Ji fetched water from his well and gave a bath to the sacred headless body and honourably cremated it by setting his whole house on fire to evade Mughal reprisal. After cremation he buried half of the mortal remains at the same spot and with the remaining half set off towards Anandpur Sahib along with his three sons and the Sangat of Delhi. Later in 1707, after the death of Aurengzeb, Sri Guru Gobind Singh Ji the only son of Sri Guru Tegh Bahadur Sahib located the place of cremation of his Guru-father and built a small memorial there. Later, the Muslims constructed a mosque at this very spot, but Sardar Baghel Singh Ji got the mosque demolished and constructed the building of Gurdwara Rikab Ganj Sahib. He buried there a metal pot enclosing a gold mohur which had inscription of all the facts on it. On the other hand, as mentioned earlier Bhai Jaita Ji and Bhai Nanu Ji had lifted the sacred head of their beloved Guru Sahib before Bhai Lakkhi Shah Ji's arrival in Chandni Chowk. For the night they kept the sacred head in Kucha Dilvali Sikhan. Unfortunately, because of lack of concern on the part of Sikhs, no Gurdwara has been constructed at this place of great importance in Sikh history. When Sri Guru Gobind Singh Ji had evacuated the garhi of Chamkaur Sahib as per his orders after crossing Sirsa canal in District Ropar of Punjab Mata Sundri Ji and Mata Sahib Kaur Ji had come to Delhi they had also stayed in this mohalla. Currently Arora Hindus reside in this mohalla and there is a Shivji Temple. In the early hours of the morning of November 12 Bhai Jaita Ji with Guru Sahib's sacred head wrapped in rumalas put in a basket started the journey towards Kiratpur Sahib via Karnal, Taraori, Ambala, Banur and Nabha. Bhai Jaita Ji decided to take the severed sacred head of Sri Guru Tegh Bahadur Sahib to Kiratpur Sahib by passing through the villages on the outskits of G.T. Road. It was decided that to provide cover over his movements Bhai Uda Ji and Bhai Nanu Ji would walk along but to evade suspicions they would be staying near but not with him. To cover this distance they made five stoppages and took five days. The first stoppage was at Taraori in District Karnal of Haryana. On the southern side of the Fort of Taraori there was a tank and in its neighbourhood their resided some washermen. Among them lived a washerman named Bhai Deva Ram Ji who was a devout Sikh. Bhai Jaita Ji contacted him. Bhai Deva Ram Ji was over-powered by emotion. He reverently kept Guru Sahib's sacred head for one night in his house. In 1710, this place was demacrated by Baba Banda Singh Bahadur Ji and now there stands the lofty building of Gurdwara Sisganj Sahib Patshahi Naumi. The next stoppage of Bhai Jaita Ji and his campanions was in Ambala city in the neighbourhood of which flowed Tangri canal at that time. The three Sikhs crossed the canal and rested awhile by putting the basket carrying the sacred head under a Jand tree. Because of the fear of the enemies they decided to spend the night in this secluded place. There they learnt from Mehar Dhumia Ji, who belonged to the cattle breeding tribe that there lived some Hindus who were devotees of the Sikh Gurus. The next morning Bhai Jaita Ji lifted the basket carrying the sacred head from under the Jand tree and along with Bhai Dhumia Ji went to the house of Bhai Ram Deva Ji. Bhai Jaita Ji narrated the whole painful incident to Bhai Ram Deva Ji who bowed his head with respect and stayed awake the whole night so that Bhai Jaita Ji and his companions could take some rest. Bhai Ram Deva Ji continued to light an earthern candle at this place for the whole of his life. In the 18th century a companion of Sardar Mehar Singh Ferozepuria Ji demarcated this place, where now stands Gurdwara Sisganj Sahib, Mohalla Kainth Majri. In 1702, when Sri Guru Gobind Singh Ji visited this area, he by chance met Mehar Dhumia Ji who had taken Bhai Jaita Ji to the house of Bhai Ram Deva Ji. Bhai Dhumia Ji was by this time very old. He told Sri Guru Gobind Singh Ji that several years ago a Sikh had come there. He had placed a basket under the Jand tree and had asked about the houses of Sikhs in that area. He also told Sri Guru Gobind Singh Ji that after conducting that Sikh to Bhai Ram Deva Ji's house he had seen some blood stains at the spot where he had put a basket. He had become very afraid but had not dared to follow that Sikh. Sri Guru Gobind Singh Ji at once realized that this was his father's Sis Asthan i.e. the place where his father's sacred head had been placed. So he demarcated the place and stayed there for 14 days. He constructed a dais there on which the Sikhs started doing Satsang i.e. community singing of hymns. At this place now stands Gurdwara Satsangat Sahib Patshahi Naumi ate Dasmi. After Ambala city, the three Sikhs started their onward journey towards Kiratpur Sahib via Banur. In the evening they stopped at the village Nabha which is about 15 kms from Chandigarh and now falls in District SAS Nagar of Punjab. Here Bhai Jaita Ji stayed in the hut of a Muslim Pir (Saint) who with deep reverence guarded the sacred head for a few hours at night to enable Bhai Jaita Ji to take rest awhile. Now at this place stands Gurdwara Sis Asthan Patshahi Naumi ate Dasmi. When Baba Banda Singh Bahadur Ji had decided to rectify the tyrannical Mughals he had started his journey after paying obeisance at this place. Bhai Jaita Ji during his whole journey had continued to sing religious hymns. When on November 16, he was marching towards Kiratpur Sahib with the basket carrying the sacred head of Sri Guru Tegh Bahadur Sahib, Sri Guru Gobind Singh Ji along with his grand-mother Mata Nanaki Ji and his wife Mata Gujri Ji had arrived at Kiratpur Sahib. On reaching Kiratpur Sahib, Bhai Jaita Ji reverently handed over the sacred head of Sri Guru Tegh Bahadur Sahib to his son (Sri Guru) Gobind Singh Ji. There in utter grief and gloom the whole sangat had a darshan (holy glimpse) of the sacred head. After placing his Guru-father's sacred head in a palanquin Sri Guru Gobind Singh Ji embraced Bhai Jaita Ji and uttered the words 'Ranghreta Guru Ka Beta' i.e. 'Ranghreta is Guru's Son'. Ranghreta was the caste of Bhai Jaita Ji. At the place where Bhai Jaita Ji handed over the basket carrying the sacred head to Sri Guru Gobind Singh Ji who placed it in a palanquin now stands Gurdwara Bibangarh Sahib. From Kiratpur Sahib the Guru-family and the devotees marched to Anandpur Sahib in the form of a procession singing hymns. On reaching Anandpur Sahib Sri Guru Gobind Singh Ji got constructed a dais near Guru Ke Mahal, the place of residence of Sri Guru Tegh Bahadur Sahib and placed the sacred head of his Guru-father on it and cremated it reverently while the whole sangat sang hymns. At this place now stands Gurdwara Sisganj Sahib. In front of this Gurdwara is Akal Bunga Sahib, where Sri Guru Gobind Singh Ji addressed the devotees and directed them to remain calm and firm in faith. At Guru Ke Mahal recitation of Sri Guru Granth Sahib was done. Hail Sri Guru Tegh Bahadur Sahib! This year the 343rd year of martyrdom of Sri Guru Tegh Bahadur Sahib is being observed all over the world on December 12, 2018.